Powers/Abilities: A highly skilled assassin, Deadeye is notorious for his lethal aim and for never having missed his mark. (Dare the Terminator#131) - Deadeye made his first appearance and presumably faced-off against Dare (Slade Murdock). 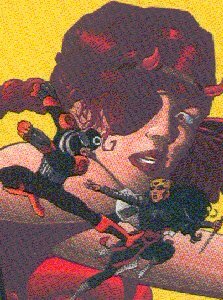 (The Nightmarish Dare #13) - In another altercation with Dare, Deadeye severely damaged her right eye (resulting in her having to wear a patch) -- although Dare had already lost her sight in an experiment involving radioactive chemicals before this incident. (Dare the Terminator #181) - After a climactic battle, Deadeye "killed" fellow assassin Catsai (Elektra Kyle). But the feline fatale, who proved to have as many lives as her namesake, returned to the world of the living soon after. 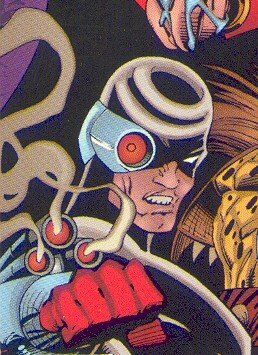 (DC Vs. Marvel#3) - When the embodiments of the DC and Marvel universes merged to create the Amalgam Universe, Deadeye was among the first amalgamated characters seen. (Assassins#1 [bts]) - Brought together by corrupt New Gotham mayor the Big Question (Edward Nigma Fisk), Deadeye and his fellow assassins, Lethal (Sergei Minerva) and Wired (Nathan Chase), discovered that they had past defeats at the hands of the same women (Dare and Catsai) in common. Together, Deadeye, Lethal, and Wired figured they could teach their mutual enemies a lesson in respect. Working for the Big Question made them think that the road to riches was all puzzled out . . .
(Assassins#1 ) - "Political Suicide" - On their way to kill the Big Question, Dare (Slade Murdock) and Catsai (Elektra Kyle) got the jump on Deadeye in the lower levels of Arkham Tower. Catsai gladly stuck one of her sais in his back, leaving the assassin for dead. DARE THE TERMINATOR is an amalgam of Marvel's DAREDEVIL (Marvel's Bullseye debuted in DAREDEVIL (vol. I)#131) and DC's DEATHSTROKE THE TERMINATOR. The cover to DARE THE TERMINATOR #181 (the issue where Deadeye [Bill Lawton] "kills" Catsai [Elektra Kyle]) is based on the cover to April 1982's DAREDEVIL (vol. 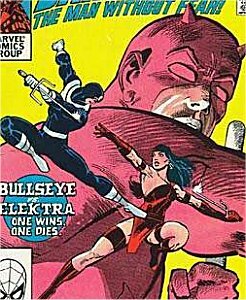 I)#181 (the issue where Bullseye "kills" Elektra [Elektra Natchios]). 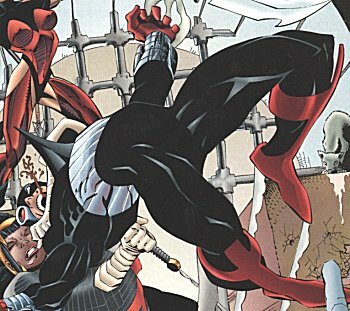 Although Deadeye, Lethal, and Wired have had long histories separately, ASSASSINS#1 marked the first time they teamed-up to give a little trouble back to the source. Although Deadeye was impaled by one of Catsai's sais in ASSASSINS#1, it is unknown whether he actually perished as a result of the fight. ASSASSINS#1 attributes Dare's (Slade Murdock) missing right eye to an altercation with Deadeye (Bill Lawton). 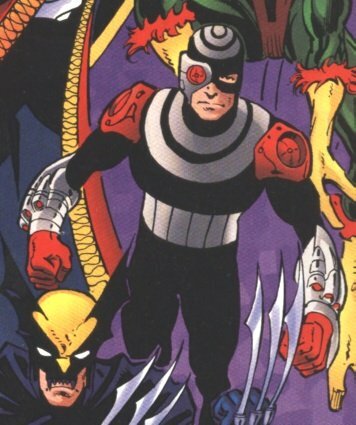 But the Amalgam Comics Trading Card Set claims that "Slade lost an eye after a long and grueling battle with the strange shape changing addict, Nuke, although she'd lost her sight to radioactive chemicals in a government experiment years before." Presumably, this is the same Nuke (Bane Simpson) who appears in BRUCE WAYNE: AGENT OF S.H.I.E.L.D. #1 as an agent of the criminal organization known as Hydra. This is supported by the fact that Nuke debuted as an enemy of Dare in DARE THE TERMINATOR#232 (although Bane Simpson has never demonstrated any "shape changing" abilities -- other than his size increase after injecting himself with the Venom steroid). It is possible that the event that led to the loss of Dare's right eye was a collaborative effort between Deadeye and Nuke. Since Dare had already damaged her eye by the time of DARE THE TERMINATOR #168, and since Nuke did not make his first on-panel appearance until DARE THE TERMINATOR#232, it is most likely that he operated behind the scenes.